I hope you had a very Happy New Year! This issue is late due to several issues as many of you may already be aware. 1. My computer decided to turn off and never turn on again. Hubby set me up with a new computer but that also brought issues as my old web design software would not work on the new computer so I'm having to learn a new program for that. 2 My Aunt had to have her gall bladder removed and that had us worried since she is in her 80's but she is home and doing well. 3. And, there was a fatal shooting at our local college earlier this week which really upset our whole town. My niece, who is like my daughter, attends the school where this happened so that day was very hectic until we found out where she was. Thankfully, she did not have class that day. 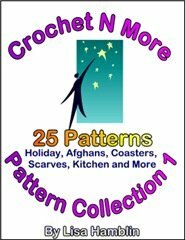 Thank you once again for being part of our Crochet 'N' More family and for your continued support of the Crochet 'N' More Newsletter and website. We appreciate each and every one of you! your life to Christ . Leftover Yarn Use: I have had best time using up all of my leftover yarn to make a multicolored caterpillar for my grandson. You can just keep on crocheting these caterpillar balls and legs, matching up wild colors until you get rid of all of your old yarn. It is hilarious! 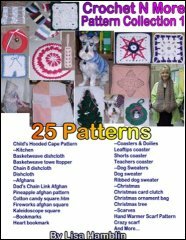 I got the pattern as a free gift from Charles Publishing along with a list of over 300 more toys to make. Their address is P.O.B. 577C, Weatherford, Texas 76086 Have fun! This is a wonderful idea for using leftover yarns... thank you so much for sharing! And as Jesus passed on from there, He saw a man, called Matthew, sitting in the tax office; and He said to him, "Follow Me!" And he rose, and followed Him. And it happened that as He was reclining at the table in the house, behold many tax-gatherers and sinners came and were dining with Jesus and His disciples. And when the Pharisees saw this, they said to His disciples, "Why is your Teacher eating with the tax-gatherers and sinners?" But when He heard this, He said, "It is not those who are healthy who need a physician, but those who are sick. But go and learn what this means, "I DESIRE COMPASSION, AND NOT SACRIFICE, for I did not come to call the righteous, but sinners." And after that He went out, and noticed a tax-gatherer named Levi, sitting in the tax office, and He said to him, "Follow Me." And he left everything behind, and rose and began to follow Him. And Levi gave a big reception for Him in his house; and there was a great crowd of tax-gatherers and other people who were reclining at the table with them. And the Pharisees and their scribes began grumbling at His disciples, saying, "Why do you eat and drink with the tax-gatherers and sinners?" And Jesus answered and said to them, "It is not those who are well who need a physician, but those who are sick. I have not come to call the righteous but sinners to repentance." NOT A CLUB FOR SAINTS." take with her after talking with Jesus? Yarn is made by twisting multiple plies of fiber together through a process called "spinning". The tighter the plies are twisted the stronger the yarn. A friend of mine purchased a set at WalMart once. used a Swiss Army Knife to whittle the end to a rounded point. I still have it! The plus for making mine homemade is the fact that mine is longer... at least 2 feet long. Very cool. I just love these﻿ tutorials! At this time I only have afghan squares and coasters that are "row count". What other kinds of row count patterns would you like to see? 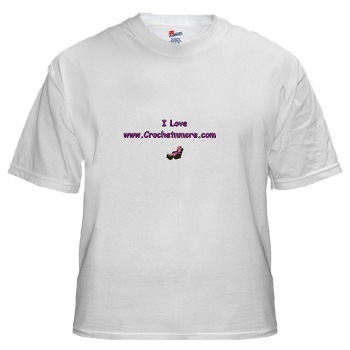 Im looking for a crochet pattern to make a fedora hat for my husband. Can anyone help? I'll post a few links... one in each comment. RE: was wondering if u wouild have something that is 30x50 that would fit a square table? 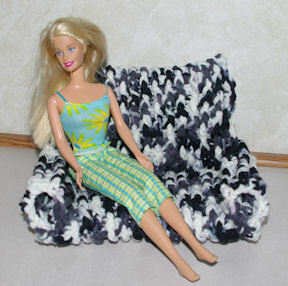 My granddaughter has requested a crocheted coat for her 11.5 inch fashion doll. I had found one a couple of weeks ago, when she wanted a fur coat, so did not save it. I really like your Breast Cancer coaster and am attempting to make a set. I've tried a few different ways but cannot figure out how you switch between the colours. I would appreciate it if you would get back to me with instructions on that. Hello, I hope you can help me! I found this free pattern before Christmas and made this scarf, I love it! 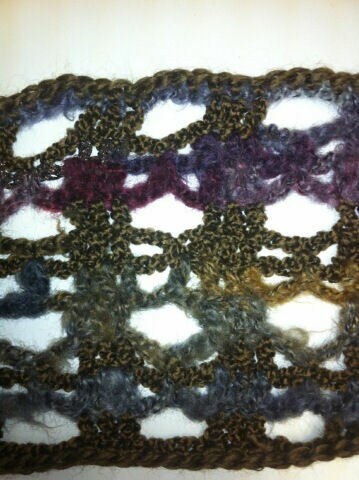 To make this pattern larger you would need to make the ends larger by adding additional row(s). Then you would have to add additional chains to the Purse Center. Additional rows added to the Purse Center will make the purse longer. Just be sure the number of stitches on the Purse Center and the Ends are the same so the joining part of the pattern works out. I am wanting to try a chevron/wavy pattern. Is there a fairly easy one you can direct me to? Thanks! Very﻿ clear and concise video! The third grade class was being given a course in first aid. The question was asked, "What would you do if you had a younger brother who swallowed the house key?" After a pause, little Courtney answered, "Easy! I'd climb through the window!" Both of my parents work and lead hectic lives. So my father was bound to forget their wedding anniversary. Remembering at the last minute, he sped to the stationery store, flew through the door, and breathlessly asked the salesclerk, "Where are the anniversary cards?" To his surprise, he heard my mother call out, "Over here, Bill." My wife turned her eight-month-pregnant figure toward him. “It didn’t seem that heavy when I carried it out,” she said. Without another word, the man emptied the barrel into the truck. As a 30-year-old kindergarten teacher was talking to the children seated on the floor around her, she absentmindedly removed her glasses to clean them. "Wow, Miss Collins!" 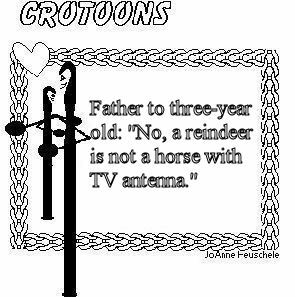 one child exclaimed. "You look really different without your glasses on!" Another child piped up, "I bet she looks different when she takes her teeth out, too!" I heard recently about a stay-at-home Mom. One evening she went to a PTA meeting and her husband and her oldest daughter got together and decided they would clean up the kitchen for her. They put up all the food, wiped all the counters, washed all the pots and put them away, put the dishes in the dishwasher and ran it. They swept and mopped the floors and then sat down, and awaited her arrival. A little girl was sitting on her grandfather's lap as he read her a bedtime story. From time to time, she would take her eyes off the book and reach up to touch his wrinkled cheek. She was alternately stroking her own cheek, then his again. Finally she spoke up, "Grandpa, did God make you?" "Yes, sweetheart," he answered. "God made me a long time ago." "Oh," she paused. "Grandpa, did God make me too?" "Yes, indeed, honey," he said. "God made you just a little while ago." My grandparents, who are real do-it-your-selfers, were sprucing up their basement. They picked out bright purple carpeting and then spread it over our lawn in order to measure and cut it. The neighbors watched curiously. After a while, the teenage daughter of one neighbor spoke up. "Our family has taken a vote," she said. "I've been elected to tell you that if we have any voice in this, we would prefer you leave your lawn the color it is." I was the new teacher for the toddler-age Sunday school class, which included my 14-month-old daughter. During a lesson on creation, I'd ask questions like, "Who made the trees?" or "Who made the sun?" and the children would respond, "God did." I was pleased the children learned quickly that God made everything. Teaching lessons at home was more of a challenge. I had tried hard to teach my daughter to pick up her toys, and she wasn't learning very quickly. One day I walked into the living room to find toys scattered everywhere. In exasperation I asked, "Who made this mess?" My daughter looked at me with a proud smile and said, "God did!" A professor was giving a big test one day to his students. He handed out all of the tests and went back to his desk to wait. Once the test was over the students all handed the tests back in. The professor noticed that one of the students had attached a $100 bill to his test with a note saying "A dollar per point." The next class the professor handed the graded tests back out. This student got back his test, his test grade, and $64 change. Tim and Carol (our son and daughter in law) had been discussing the high cost of going to the Our Videos with the boys. Tim told B that when Papa was a little boy he could take a quarter to the Our Videos, watch the movie, buy a drink and candy. Instead of being dazzled by the now inflated cost of movie going, B wanted to know was that because they didn't have dollars when Papa was his age. One day I decided to take my three children to a skating party in a nearby town, but after several wrong turns and stops to ask directions, I pulled over to the side of the road and suggested we all ask God to help us find the rink. When we finally arrived, we were nearly an hour late. The following week, as we got into the car to go skating again, my five-year-old son exclaimed, "Mom, let's pray now and save time!" During children's church, Katelyn learned about Jesus and that he lives in heaven. After church, Katelyn asked her mother Dawn if they could go visit Jesus. Dawn told her that no one knows how to get to heaven until God calls you home. She said "Well, Mom, just MapQuest it."